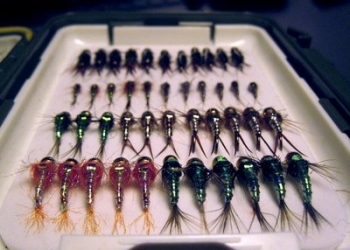 We will be giving away a dozen custom tied flies by commercial contract tier Brett Wedeking. All you need to do is submit your fish (it doesn't have to be a big one) to us by email. Send your entry to info@offthehookflyfishing. Off the Hook Fly Fishing hosted an energetic group of 8 anglers last weekend on the Yuba River here in Northern California. The group was fantastic and made up of young professionals most of which had known each other for years. Their personalities, viewpoints and vocational experiences were as unique as their past fishing experience. I had the pleasure of fishing Joe and Kristin B from Chicago Il. on Putah last week. They had fished a bit before and were brand new to fly fishing. They were great and their let’s do it attitude made the day a real pleasure. Flows were still very high (600+) as they typically are during the summer. We started off the day with casting instruction and some brief insect study. We saw some insects, rock worm caddis, tons of midges, and some small baetis. Kristin hooked a couple of fish and used the long line release technique. Well it's been a funky summer to say the least. With the incredible amount of rain and snow we had this year we were starting to think that the summer would never start. Now that water levels have settled the fishing is on fire. This morning I was treated to taking out a 15 year old kid named Jack. Jack told me that he had done quite a bit of fly fishing already though neverbecause in "Northern California. I could tell by the way he said it that he was already afly fishing addict. After the first five minutes of watching him roll cast, mend, and read the water I could tell that he was a stud. I told him what a challenge Putah Creek can be but if you get technical you can do pretty well. I took us a couple of hours to find the fish but once we did we caught fire. During the winter I was given a lead on a small creek here in the valley that was loaded with wild fish. I had almost forgotten about iI until my buddy phoned me and said he wanted to fish but fish somewhere new. I told him about the lead I had on this place but did not really know what to expect. There is a great feeling of joy heading out to a place that you have never fished. You run the chance of the day being a total bust but we were prepared for that if it were the case. Warm weather, high water, and lots of day traffic as of recent on the creek. Just a taste of whats to come. 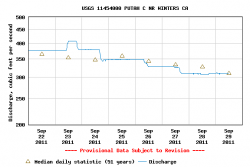 Last I checked the flows were at 450 and they will only be rising. Not to say there aren't ways to get in and catch fish but your really need to know the spots, how to access them, and how to get creative with your casts to get your fly to the strike zone. Needless to say that fighting fish at these flows can be as tough as hooking them. Everyone trickled in Friday afternoon to the campground. A significant portion of the participants were brand new to fly fishing so after camp was setup, we broke out the fly rods and yarn flies for casting class. Even the brand new guys picked it up casting quickly. Once everyone was up to speed we decided a little hike was in order while dinner was being prepared. On the evening’s menu were three delicious tri-tips from the infamous Buckhorn Steakhouse, huge baked potatoes with all the fixings, and grilled corn bathed in butter. All of this washed down with some tasty adult beverages. For dessert we had a variety of goodies but the main course was a decadent chocolate birthday cake for Dustin R. one of the participants. Once everyone was finished eating some good old fashion story telling took place over beer and wine around a crackling campfire. We woke up early o” clock Saturday morning so we could be the first boats on the water. Fishing a group of this size takes some additional planning and maneuvering on the river. After meeting up with the guides everyone got suited up and hit the river. What an amazing day it was! Temperatures were cool first thing in the morning. The bright morning sun and the cups of java however went a long way towards waking tired bodies. The clean crisp air and anticipation soon had us focused and excited for the day’s experiences. With a heave the boats took off. It was merely a few moments before “fish on, fish on!” was echoing up and down the canyon from the boat I was in. This time of year sees Salmon make their yearly migration into California’s rivers. Resident fish like the trout in the Yuba key in on this and move in behind the salmon to feast on any eggs that tumble astray. We fished rubber legged stone fly nymphs and caddis pupa, but the egg patters seemed to be the best producers. Four of the 8 guys caught their first(and second and third…) Trout on a fly rod on this trip! Our guides love sharing our passion for fly fishing and the ecosystems that trout inhabit with newcomers! By mid day Temps warmed to the high 70’s and at one point waders became a little warm and rumor has it that there were boats floating down the Yuba River with guys fishing in their boxer shorts! The group met back up in the afternoon to enjoy the remainder of the long float together. It was great to see the camaraderie and have fly fishing be the draw that brought many of these life long friends back together again. After comparing notes and numbers, the consensus was that everyone had a fun and memorable day! Thanks gentlemen for the great trip and for all the laughs! You are all welcome in our boats any time! Off the Hook will be putting more group trips together soon. Check back in for dates or to join us on our next adventure. Have a group that you would like to get out on the water? We offer great rates for corporate trips, bachelor/bachelorette parties, and birthdays. Contact us about planning an unforgettably fun adventure for your group. We will rely on over a 100 years of collective fly fishing knowledge and experience to direct you to the best possible fishing experience no matter your fishing experience. 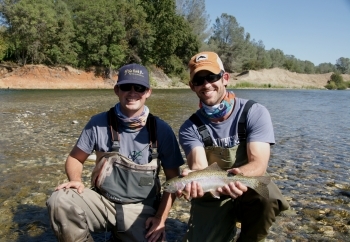 Northern California offers exceptional year round fly fishing opportunities and will handle all the food, guides, lodging and transportation to fit your budget.